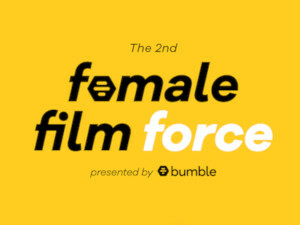 This year, Bumble is expanding the initiative to filmmakers in France and Germany as well as in the UK. To enter, applicants must download Bumble, enter Bumble Bizz and match with the Female Film Force application card. Applications for Round One will close on March 20th, after which a shortlist will be announced and the selected filmmakers will be asked to submit further materials to support their ideas. Ten teams will be asked to pitch to a panel of industry experts from France, Germany and the UK in London in May. Five chosen teams will again be awarded £20,000 each to make a short film. Over the production period, the filmmakers will receive guidance from leading industry experts as part of a mentorship program created in partnership with WDW Entertainment and Female Film Force Producer Elisabeth Hopper. The completed films will premiere in January 2020 at an exclusive industry event. Bumble’s second entertainment initiative is leading the charge against the gender gap in the world of electronic music. Making Moves in Music (MMM) is an international campaign and contest designed to give female DJs access to mentorship from top music executives. Participants will also receive access to masterclasses in Los Angeles and Europe, the opportunity to work with renowned electronic music label Astralwerks and a guaranteed performance slot at a prominent music festival. Applications for the first Making Moves in Music campaign closed in December 2018. Over 500 aspiring artists entered the competition competition. After boot camps in Amsterdam and Los Angeles, 25-year-old Dutch DJ and producer Nicky Elisabeth was chosen from three finalists for a release on Astralwerks and a time slot on the STMPD RCRDS stage at the 2019 Ultra Music Festival in Miami. For more about this dating service you can read our Bumble app review.